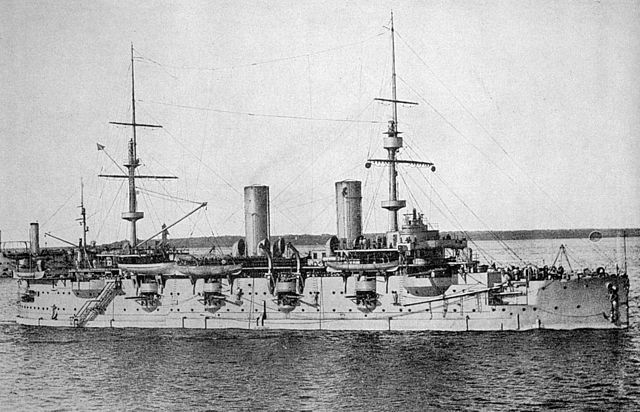 The Petr Velikiy (Peter the Great) was undoubtedly the oldest Russian battleship in service in 1914, the babochka (“Grandma”) of the Russian navy. This battleship knew several lives. 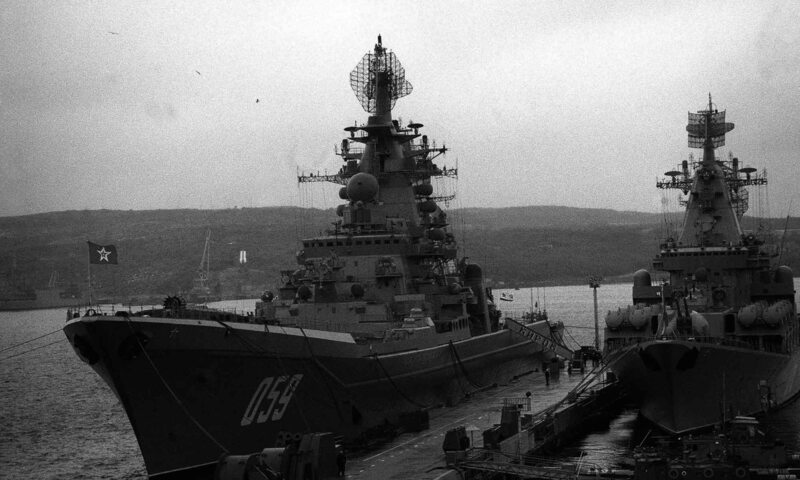 It was in its day the very first Russian battleship with turrets and steam alone, a fashion launched by France and Great Britain and quickly followed by the tsar for the Baltic fleet. Probably the biggest and most modern Russian warship drawn in the late 1860s, the Пётр Великий – Peter the Great, was an ironclad turret ship, started in july 1870 at Galerniy Island Shipyard, Saint Petersburg and launched 27 August 1872, for over 5.5 million rubles. The plans betrayed a strong British influence, notably the contemporary HMS Dreadnought (1st) class ironclad of similar configuration, but was initially inspired by the American twin-turret monitor USS Miantonomoh when visiting Kronstadt in August 1866. Rear Admiral A. A. Popov was its designer, and initially proposed a low-freeboard breastwork monitor with full rigging. Peter the Great was completed however in 1876 with a revised design. From the initial hybrid monitor-cruiser design, submitted to the Naval Technical Committee in 1867, the design evolved as it was ordered the coal carried to be raised from four to five days steaming, triggering design modifications. The design was revised 26 January 1869, but other changes were added by Popov himself, like a central superstructure forward of the breastwork to improve seakeeping and overhanging side armor. The revised design was again submitted and approved in 19 June 1869 but meanwhile the displacement made a jump from 7,496 long tons to 9,462 long tons. While building started, new changed were made to “Kreiser” (cruiser), the rigging was deleted, spar torpedoes added, and after a visit and advice from naval architect Edward Reed, armour was increased to 14in (356 mm). The ship was then renamed in 1872 to celebrate the bicentennial of Peter the Great, founder of the Baltic feet. Popov’s ironclad was just 100.5 m long at the waterline (330 feets), and on completion her displacement rose to 10,406 long tons (10,573 t). For rigidity and protection, she was subdivided by one centerline and longitudinal, nine transverse and two wing watertight bulkheads, plus complete double bottom. She had a low freeboard and rolled a lot, generally considered as a passable sea-boat. She also had two three-cylinder horizontal return connecting rod-steam engines, each with a propeller. Each was fed by 12 rectangular boilers (36 psi) for a total of 9,000 nominal horsepower (6,700 kW) and a top speed of 13 knots (24 km/h; 15 mph) and 1900 nm of range thanks to a reserve of 1230 tons of coal. Boilers proved of frail construction and showed numerous defects, as built by Scottish-funded St Petersburg Baird Works. Sea trials showed it could only reach 11 knots, and the chimney was raised by about 20 feet, but with little effect. The main armament comprised four muzzle-loading smoothbore 20-inch (508 mm) guns (US. Rodman design), but eventually, an enlarged version of the German 280mm Krupp was chosen, to produce a 12-inch, 20-caliber type. Rather than the muzzles, the hydraulic turret machinery raised and lowered the guns’ trunnions. Range, at 12.5° was 5,800 yards (5,300 m). The 360 long tons (370 t) Coles type turrets fully revolved in a minute although because of the superstructure, only 310° was practical. Secondary armament was defensive against torpedo-boats, six 4 pdr (3.4-inch (86 mm)) guns (4 bridge, 2 stern), and two Palmcrantz 1 pdr (1-inch (25 mm)) Gatling-type machine guns. There were in addition four telescopic spar-torpedoes mounted in the bow, which mostly acted as a ramming deterrent for other ships. 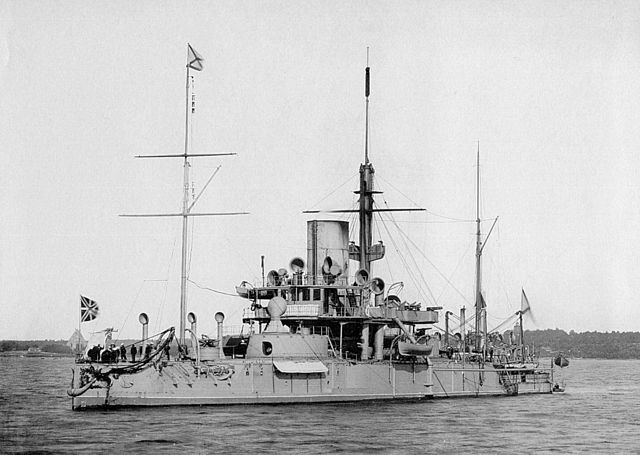 Early on, in the context of the Russo-Turkish war of 1877 and British threat, two 9-inch mortars were fitted on her quarterdeck, later removed in 1880. After many complaints about the machinery (Baird works received a penalty), John Elder & Co., in Glasgow, Scotland, in October 1880 was contracted. Refitting lasted to February 1882. In addition to be reliable and lighter, the machinery allowed the ship to reach 14.36 knots (26.59 km/h; 16.53 mph). She departed Scotland for a Mediterranean cruise, visiting many ports, then headed north, before reaching Kronstadt on 12 September. In the mid-1880s two 44-millimeter (1.7 in) Engstrem guns replaced the rear deck 4 pdrs, her boilers were replaced in 1892, and by the mid-1890s, four additional 4-pdr were added to each turret, plus six 47 mm (1.9 in) 5-barrel revolving Hotchkiss guns (bridge) four 37mm (1.5 in) Hotchkiss guns (deck). Considered obsolete by then, several reconstruction proposals were made. Eventually, this was postponed until a new minister of the Marine came at the office and decided to convert her as a gunnery training ship. The reconstruction plan was approved on 2 February 1904. 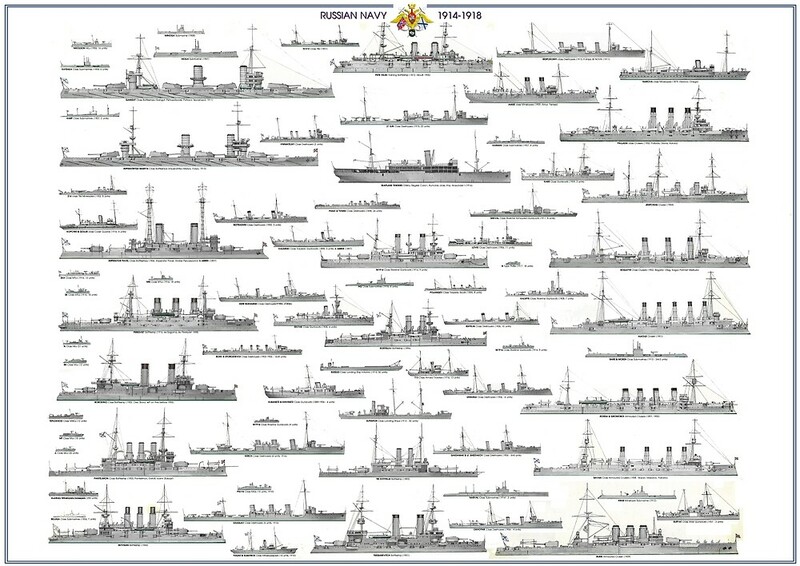 In 1905-1906 she was entirely rebuilt, with new machines and boilers, two chimneys, two light masts, a high freeboard thanks to a completely redesigned hull, a displacement reduced to 9790 tons and a new armament: Exit the antique 305mm, the artillery now included 4 x 203 mm on the upper deck at the four corners, and 12 x 152 mm on the lower deck in casemates. The rest consisted of small pieces on the main deck. Petr Veliky was now 321 feet 10 inches (98.09 m) long overall, 62 feet 4 inches (19.0 m) wide, with a 26 feet 7 inches (8.1 m) draft. Displacement was reduced to 9,790 long tons (9,950 t). Top speed was 12.9 knots (23.9 km/h; 14.8 mph) for 714 long tons (725 t) of coal and 1,500 nautical miles (2,800 km; 1,700 mi) range. She was completed the following year of the Russo-Japanese war. 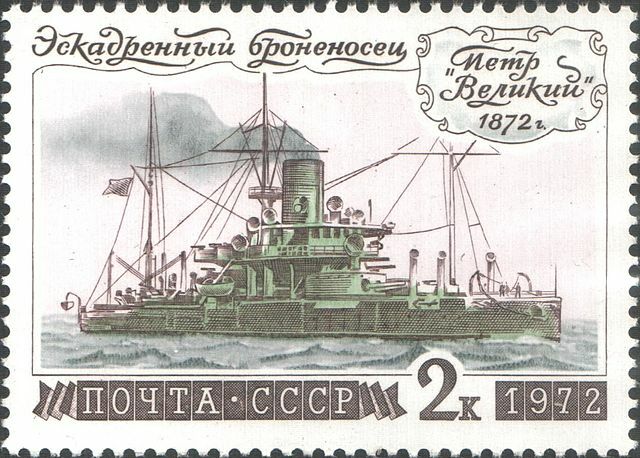 She was in 1914 assigned to the Baltic fleet, but played a secondary role, mainly coastguard and part of the Gunnery Training Detachment through 1917 as planned. In February 1917 she could have been was renamed Respublikanets or Barrikada (Barricade), by the Soviets (still unconfirmed). Retired afterwards, she was completely disarmed in October 1918 and converted as a depot ship for submarines at Kronstadt, then Helsinki. It was subsequently used as a mines carrier and was renamed Barrikada. Hulked on 21 May 1921 she was used to store mines. Renamed Blokshiv Nr. 1 on 4 December 1923 she was forced aground in shallow water by autumn floods in September 1923. She was refloated and repaired in 5 October 1927 and in January 1932 renamed Blokshiv Nr. 4, then BSh-3 (1949) barrack ship at Kronstadt. She was eventually stricken on 18 April 1959 and scrapped, after a 80+ years long career. Petr Velikiy on a stamp from 1974.